The jaw-dropping R Series by Bennington Pontoon Boat continues the tradition of style, comfort, versatility, and performance that boaters have come to expect from a luxury pontoon boat manufacturer. 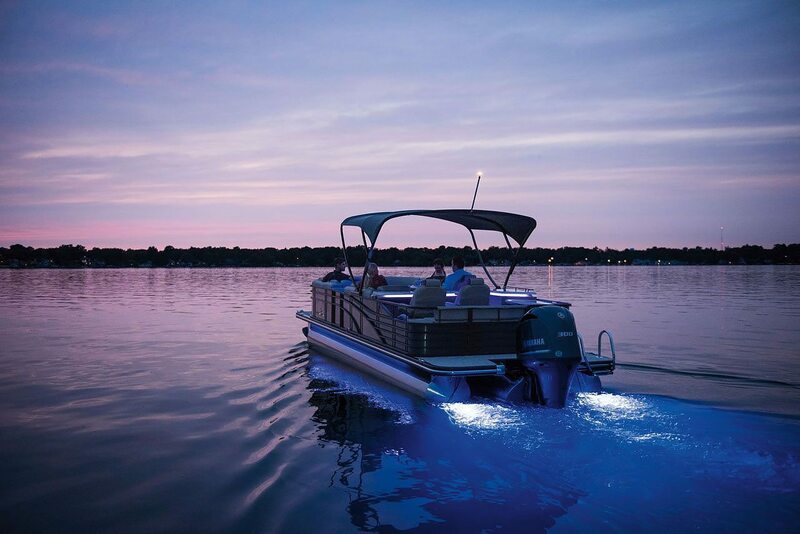 The R Series was designed to give pontoon boaters total customization on a performance platform. With the largest range of sizes to work with of all of Bennington's models, the R Series can be styled to match your specific personality and needs, in deck lengths from 21' to 30'. When it comes to designing your R Series luxury pontoon boat, the options are nearly endless. You'll begin by selecting the length and layout that fits your desired boating experience. Whether you're a thrill seeker or a bass fisher, Bennington has you covered. Floor plans are available in Cruise, Swingback, Stern Radius and Fastback, Club, Fishing, Dinette and Entertainment Bar, and Stern Lounge with dozens of options available for each. Who needs a night on the town? With the R Series pontoon boat Dinette layout, you can skip the long wait at the 5-star restaurant and treat your companion to a nighttime dinner cruise in a 100-billion-star setting. Gorgeous hand-stitched pillow top seating, ample armrests, copious cup holders, and discreet USB ports make relaxing summer evenings even more enjoyable. Hosting the family for the weekend? Welcome to the official "No Boredom Allowed" station. Built for speed, precision handling, and overall entertainment, Bennington Pontoon Boats are the perfect boat for water skiing, wakeboarding, and lake diving. Coupled with Bennington's legendary Elliptical Sport Package, you'll be turning heads across the lake all summer long. Regardless of your pontoon boating style, there are some things that everyone can agree on -- it's all about the extras! Amenities and accessories are just one more reason why Bennington rises above the pack. Optional additions like RGB LED lighting with 13 variable color patterns set the mood for sunset cruising, while rear speakers keep everyone moving and grooving. At the helm, the captain enjoys comfortable control with the stainless steel Corvina Steering Wheel, trimmed in leather, and partnered with Seastar hydraulic steering (with available power assist). Start designing your dream R Series by Bennington Pontoon Boats today at our online design center, where you can customize every feature for the perfect pontoon-boating experience. You can also locate a knowledgeable Bennington Pontoon Boat dealer using our dealer locator. Learn more about the R Series online at https://www.benningtonmarine.com/series/r/.